I love these things. 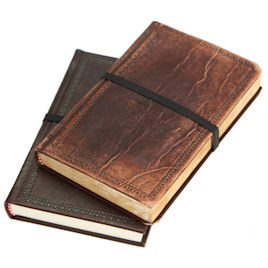 It is so difficult just to find a basic journal: most of the moleskine-type journals have thin paper that doesnâ€™t work well with a fountain pen, while most other journals are too ornate. The Professorâ€™s Diary is perfect: durably constructed, small enough to fit in your back pocket, and once you get past the first few pages and break it in, itâ€™ll basically lie open for you as you write. Iâ€™ve filled two of these journals already, and plan to fill many more.